Belloccio Radiant Bronzer - A radiant enhancer for eyes and cheeks. Applying bronzer after foundation will create a natural sun-kissed glow to make any makeup look polished. Instantly brightens, is long lasting and helpful for keeping skin smooth and flawless. Apply Belloccio Bronzer on the face, neck and body. 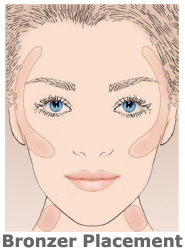 Applying bronzer after foundation will create a natural sun-kissed glow to make any makeup look polished. To correctively enhance the features you were born with, apply bronzer below cheek bones no further in then the corner of your eye and no further down then the bottom of your nose. You can also bring a little up in the temples of your forehead as this is a natural section that the sun hits. This corrective technique will not only give your cheek bones a lift and pop but with applying a small amount on the temples you can create a beautiful glow to your skin. Belloccio’s exclusive airbrush foundation, blushes, shimmers and bronzers will change your makeup application forever! Belloccio airbrush makeup not only looks beautiful on the skin but also contains skin care benefits giving you the ultimate makeup experience every day!